The price of morphine rehab is anywhere from $135/day to $335/day. While cost remains a big factor for individuals considering treatment, help is available. And learning how to cope with the cost can ease some of the reluctance toward going into treatment for many. More here on the cost of morphine rehab. Morphine is a strong prescription opioid analgesic used to reduce severe chronic and acute pain. However, morphine is also very addictive, especially when used on a regular basis. And while morphine rehab is sometimes necessary to break an addiction to this drug, you don’t want to break the bank doing it. Here we review what can you expect in terms of cost and finances? Then, we invite your questions about morphine rehab at the end. Make a long term investment in your health. Dial 1-877-959-1228 and begin your journey to sobriety. What Is Morphine Rehab Like? Rehabs are like a combination of adult education classes, summer camp, and psych wards. Emotions run high, group dynamics are ever changing, and counselors take on the role of authority. However, drug rehab is a wonderful place to begin to learn about addiction, yourself, and how to stop using morphine. What can you expect from the two main types of rehab? 1. Inpatient morphine rehab is a type of rehab that requires residence. This means that you sleep overnight for the duration of your stay in the rehab facility and over the course of addiction treatment. Typically, there are several people in different stages of treatment in a facility at one time. Some morphine rehab facilities offer medical detox services to individuals entering rehab, and methadone may be used to help break a morphine addiction. During the course of morphine rehab, you will also undergo daily psychological treatments, such as individual counseling and group therapy. Inpatient morphine rehab can last anywhere from a month to a year. 2. Outpatient morphine rehab does not require a person to reside in a rehab facility. This type of rehab may be used as a sole treatment for morphine addiction or it can be used as follow-up treatment after a person has completed an inpatient program. During outpatient morphine rehab, a person will usually attend several counseling sessions each month and be required to meet a minimum participation requirements. Opiate replacement therapy, such as the use of methadone, may also be used during outpatient morphine rehab. What’s The Cost Of Morphine Rehab? The cost of morphine rehab can be hard to pin down, and will vary from one rehab program to the next. Costs are based on inpatient vs. outpatient, location, services used, and length of time spent in rehab. When considering the cost of morphine rehab, one should also take into consideration the use of opiate replacement therapy. When methadone is used, the cost of methadone rehab will increase, sometimes substantially. Inpatient morphine rehab is typically the most expensive treatment option for morphine addiction. The price of this treatment can range from a couple hundred dollars per day to a few thousand dollars per day. This price generally includes room and board as well as treatment. Rehab facilities that offer spa-like atmospheres will typically be on the higher end of the spectrum. Outpatient morphine rehabilitation is often a more economical option, but requires strong dedication and program commitment. The price of outpatient treatment is usually calculated per hour, which can also vary widely. An hour in 12-step group meeting is free, for instance, while an hour with a licensed counselor, psychologist, or psychologist can cost a hundred dollars or more per hour. In general, rehab can cost you from $1,500 at its most basic and up to $20,000 or more. According to a 2011 study conducted by Open Minds Consulting, the average price for a 28-day rehabilitation program was around $19,067. The average price of a 10-week intensive outpatient methadone program was roughly $6,863. According to a study conducted by the Substance Abuse and Mental Health Services Administration (SAMHSA), however, the mean cost of each residential rehab admission was $3,132, outpatient non-methadone rehab was $1,169, and rehab with methadone was $6,048. Not everyone will have to pay the full price of methadone rehab. Health insurance companies, government entities, and rehab centers themselves will often partially or fully cover the cost of morphine rehab for most individuals. If you are worried about your recovery treatment costs, don’t let these concerns discourage you from trying to get sober. Getting the help you need to live a sober and happy life should be your number one priority. A variety of crowdfunding platforms allow you to raise the money you need to enter a rehab program and become drug-free. GoFundMe and Indiegogo are platforms that allow you to create a campaign where people can donate as much as they are willing to. You can ask your friend to share the link . Rehab centers offer their understanding about people’s financial hardships. In order not to get in the way of people’s recovery, some rehabs offer payment options which include automatic monthly payments and graduated payment plans. Discuss with the rehab specialists your financial situation. This will reduce your stress and leave space for you to focus on the most important thing of your recovery – reaching and maintaining sobriety. 3. Borrow money from your personal saving accounts. You can apply for federal funding and grants to help pay for your treatment. A grant is a sum of money given to people for a specific purpose such as addiction treatment. The best part about a grant is that you do not have to give the more back. For more information visit Substance Abuse and Mental Health Services Administration (SAMHSA). 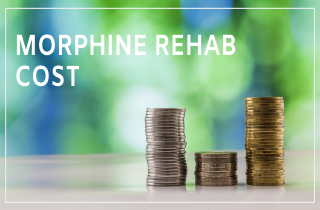 In this article, we’ve discussed the cost and factors affecting the cost of morphine rehab. While the cost of morphine rehab may seem high, it’s rare that someone will have to pay full price for treatment. However, if you’re still concerned about covering the costs of morphine rehab, feel free to leave your comments or questions below. We’ll do our best to address your concerns and point you in the right direction for treatment. Don’t let anything get in the way of your sobriety. Financial difficulties should not stop you from treatment. Dial 1-877-959-1228 and start your recovery journey.